Many consider Samsung's new AR emojis that launched with the Galaxy S9 and S9+ a rather gimmicky feature, but the following announcement could be considered proof that AR emojis are here to stay. 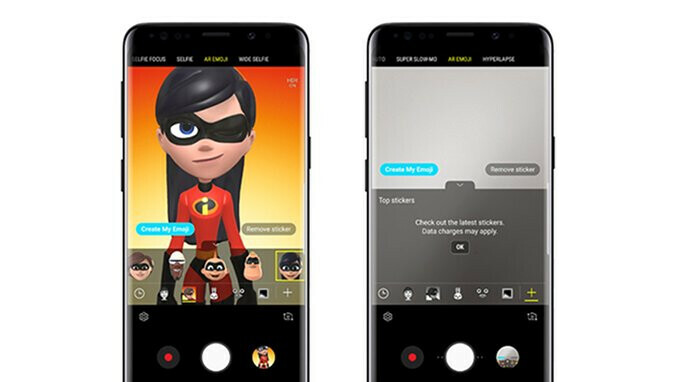 The South Korean company confirmed recently that it has teamed up with Disney to provide Galaxy S9 and S9+ owners with even more AR emojis. All five members of the super family, the Incredibles and their friend, Frozone, have just joined the already available characters of Mickey Mouse, Minnie Mouse, and Donald Duck. Starting today, Samsung Galaxy S9 and S9+ owners can personalize their messages with AR (augmented reality) avatars of Mr. Incredible, Elastigirl, Violet, Dash, and Jack-Jack, as well as Super Frozone. In order to add the new AR emojis to your phone, simply head to the camera app and access the AR Emoji mode. Then, tap the plus icon that you'll find on the right-hand side, and select The Incredibles AR Emoji pack from the Galaxy Apps Store. Gimmicky on both Samsung and Apple but, if that is something others like more power to them. Not my thing. The tracking of facial expressions and speech is way more accurate on the iPhone X, however the S9/S9+ offers far more audio recording time and way more Animoji options. I personally think both are a lot of fun, but have to give the nod to the S9’s for being the more amusing. I don't care for it. Downloading it for my kids to play around with. I'm sure they'll like it. Same here, I only open it because my kids love it. But from a technical point of view, it's rubbish. The tracking is pretty awful, and the movement of the characters is kinda sluggish. The variety of characters, and the fact that you can create their own emojis is what keeps them interested in it. Agreed. The mouth is janky AF but the eyes and cheeks are great. They need to fix the mouth tracking. Can you tell me why s8 s8+ can't have this "feature"?